Too little, too late...? Work on the medieval chapel is expected to start this week. Stabilisation works on Gozo's only medieval chapel are finally expected to start this week, though the ceiling has now also started caving in. The Gozo Ministry said when contacted that it had made a request to the authorities so that "urgent" stabilisation works can be carried out at the chapel. However, the ministry did not say why action has been promised so late in the day, and after the many appeals to restore the St Ceclia Chapel in Għajnsielem over a number of years. Heavy rainfall in recent months has taken its toll on the chapel and most of its west wall has now given way. The incident took place just weeks after The Sunday Times highlighted the precarious state of the chapel, which is believed to have been built around 1540. Wirt Għawdex executive secretary Giovanni Zammit said yesterday there was now only one wall supporting the arches and it was likely that the entire ceiling would have to be replaced. Cracks are snaking through several of the roof slabs and the soil infill, used to keep the wall together, was coming apart. The damage is believed to have been exacerbated after an ancient waterspout on the roof of the chapel for the overflow of rainfall was stolen. The chapel was set on fire last August, and still it failed to prod the authorities into taking action. Though partly dilapidated, the chapel is still in its original form, and is the best surviving example of the unaisled chapels that once dotted the countryside. Mr Zammit said his request for a meeting with the Gozo ministry during the past week has been ignored, despite the urgency of the matter. "This is an emergency and we can't afford to delay the decision further," he said. The site was expropriated in 1997 and promised to Wirt Għawdex but the authorities have been reluctant to proceed with the execution of this order, claiming there was an issue of compensation. According to the NGO, the chapel appears to have been caught up in a crossfire involving an individual who owns land nearby. Mr Zammit said the NGO was only asking to assume responsibility for the chapel and the three-metre perimeter around it. The Gozo ministry would only say that the "finalisation of the evaluation of the revised land for expropriation was concluded recently". The original cost to restore the chapel was believed to have been around €23,000, but Mr Zammit said that figure would now be significantly higher. It is thought that the authorities are still in time to save the chapel, however. 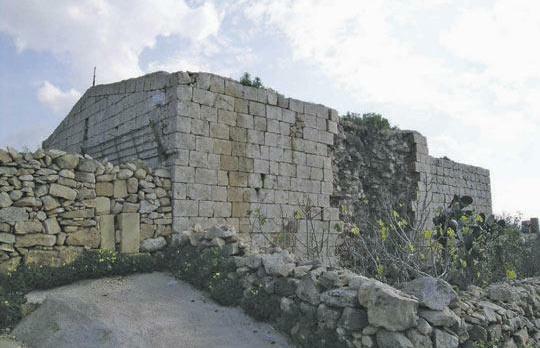 Mr Zammit, who lived for 25 years in Canada before returning to Gozo, is appalled by the evident disregard for the island's history. "Canada is just 125 years old and yet they are so protective of their history to the extent that they would even protect an 80-year-old house. We've got a much richer history and are letting it fall apart."